As you can see from the graphic above, this book will be followed by an 8th book which serves as an “epilogue” to the Corrosive Knights story line and which I’ve already finished the first full draft. Before getting into details, a quick anecdote -and warning! Yesterday morning I finished up most of the book save for, quite literally, the last three pages. Much as I wanted to finish it all up, I had to leave the computer and the draft behind to do some other work. I would not be able to return to finish those last three pages until after 5 P.M. So I return home and, while the food’s cooking, sit down in front of the computer to finish up those last bits of the book. Again, 3 pages worth. I turn the computer on and… something weird happens. I use Microsoft Word for my writing and have the file both on the hard drive and on my One Drive. I do this in case I’m able to use my laptop elsewhere to work on the book. Highly recommended. I tried to load up both Word and Excel (this is for my other job), then try to load up files for each program and then… nothing. I get a very, very sinking feeling in the pit of my stomach. I shut both programs off. I restart them. I try to load the files back up. Now I’m sweating as my creative life flashes in front of my eyes. The work I’ve done on draft #6 of the book was mentally very strenuous. I’ve done so much damn work and the idea that all of it, right up to three freaking pages before the very end, may be gone just about gives me a stroke. I wonder if I have the mental strength to get into that book again, should I have lost all the work I did to this point. Seriously, I didn’t think I could. Not right away. Needless to say, the first thing I then do is make ANOTHER copy of that draft on my hard drive before getting to work and finishing the whole thing off. Then, I made ANOTHER back up copy of the finished product. Moral of the story: Make multiple backups. Then, make some more. Just in case. Back to the update: Book #7 of the Corrosive Knights series is, in my humble opinion, one of the most challenging to work on. 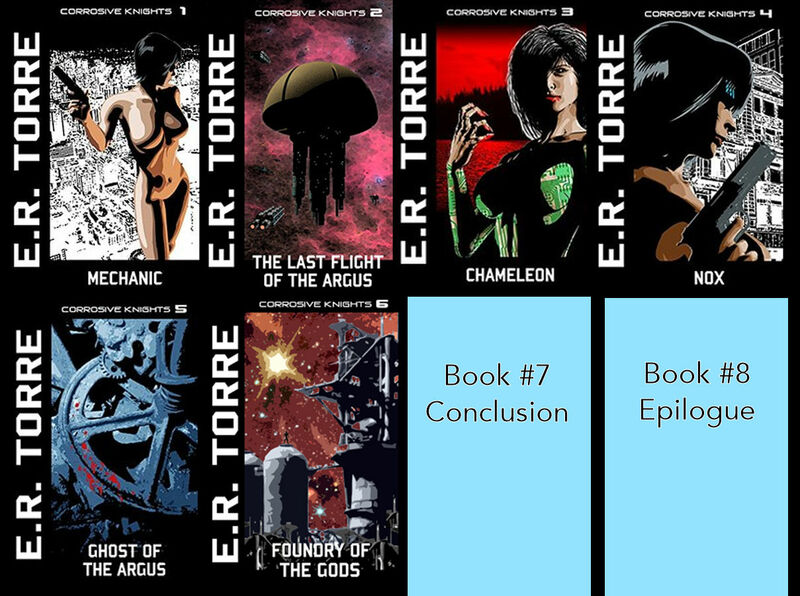 With this series I’ve created a story that unfolds over 20,000 plus years and I’ve taken great pains to make sure this story, which is complex, isn’t complicated. Further, Book #7 is a concluding chapter and therefore it HAS to focus on and resolve all the major plot points I’ve raised/opened from the first book (Mechanic) on. And so far I’m incredibly pleased with the results. I noted, when I began the 6th draft of this book, that the first half of this book is good but the second half was what required work. I realized this after I read through that draft (from 4/21 to 5/16) and then started putting the corrections/additions into the computer (this took me from 5/17 to 6/26). In terms of time spent on this draft, its taken a little less than 2 and a half months to go through this draft. I suspect, strongly, draft #7 will take half that time. Why? Because I’ve dealt with all those issues in the little more than second half of the book and feel that all those issues I knew were there were dealt with via my revisions. As of yesterday, this book is that much closer to being ready for release. To date, I’ve written six books and spent nearly ten years working on this series and, while we’re approaching the end, I’ll be damned if I don’t release something that isn’t my absolute best. So hang in there, kind folks. The work on Book #7 moves along nicely. Today I’m giving myself a day to rest and unwind before printing up this latest draft and quickly moving on to draft #7. I strongly suspect, based on being able to fix the things I knew needed fixing in draft #6, that future drafts will focus more on the actual mechanics of the writing, ie spelling and grammar and streamlining bloat versus actual “creative” writing. Once I fully reach that point, things will move much quicker and the book will soon be available.